Why Your Fire Alarm System Sets Off By Itself | Calgary Alarm Inc. Smoke detectors have a life expectancy of 10 years from the date of manufacture, and should be replaced promptly to protect your family from fires. However, a new but faulty fire alarm system can also put your loved ones at risk. If your fire alarm system keeps setting off by itself, it is probably because of one of two issues: poor maintenance or a malfunctioning unit. Dust or dirt on the sensor – If you have an old smoke detector that detects smoke by ionization, any false alarms could be caused by the unit mistaking dust for smoke. Check to ensure that you have an ionization-type detector. The model number should have the letter “I,” or a mention of radioactive material such as Americium-241. 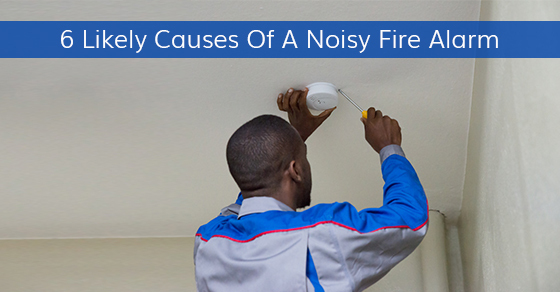 The best fix is replacing the unit with a modern smoke detector equipped with reliable technology. If it’s a new unit, vacuum it gently using a soft brush, and prepare a cleaning schedule to prevent dust from accumulating inside the cover. Insects clogging the sensor chamber – Clean your smoke alarm regularly using a soft brush attached to your vacuum. Wrong placement – False alarms can result from bad placement of the unit. Manufacturers recommend that smoke detectors be placed at least 3 feet from any AC and heating vents, 10 feet from high humidity areas such as laundry rooms and bathrooms, and 20 feet from heat generating appliances such as ovens, stoves, fireplaces or furnaces. Loose electrical connection – A loose hot wire connection in an AC smoke alarm can sporadically disconnect power supply to the unit. The result is similar to a power interruption. When the connection (power) is restored, the alarm may go off briefly. A large current load – Smoke alarms should be connected to outlet or general lighting circuits in bedrooms to make it easier for residents to detect when the circuit breaker to the alarm system has tripped. If you use the same circuit for other high-power consuming appliances, such as vacuum cleaners, you risk having repeated cases of voltage drop in the wiring that trigger the alarm. Old unit – An old detector will generally malfunction due to normal wear and tear. Smoke detectors should be replaced every 10 years, but you can replace them earlier to avoid recurring problems. Your fire alarm system may also beep when the furnace is turned on after installation or a long break; or due to drywall dust, dirt, construction debris, or old oil and residue inside the duct work. Whatever the reason, never ignore fire alarm beeps as they could save your life.